Picnics welcome. Access for visitors in wheelchairs to outer bailey. Bus: Western National 76 Plymouth - Launceston; Tilleys from Exeter. The castle at Launceston dominates the surrounding landscape - perched on top of a large, natural mound. The Castle was the ultimate status symbol of Middle Age wealth and power. Originally known as Dunheved. It was an impressive and strategically important building that controlled the river crossing in and out of Cornwall. The castle at Dunheved was first built as an earthwork castle, after the Norman conquest. Located high on a grassy mound overlooking nearby settlement of St Stephens. The location meant that it became the administrative headquarters for the great Earls of Cornwall - where they could control the vast estates that they owned throughout the area. The castle remained with little development, apart from an inner keep added in the 12th century. During the 13th century, Richard, Earl of Cornwall, a younger brother of Henry III began a transformation of the castle, rebuilding the edifice in stone. 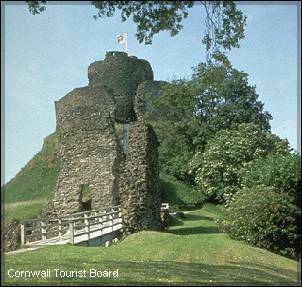 Richard of Cornwall, Henry III's one of the wealthiest and most powerful men in England during the thirteenth century, improved the defences by building a curtain wall that skirted the original mound and rebuilding the gatehouses adding the latest design of drum towers. He rebuilt the central free-standing tower within the existing twelfth century keep. The tower improved the accommodation at the castle and gave the occupiers a much higher fighting platform for defence. Later the space between the tower and the 12th century keep was roofed over to create a series of concentric platforms to aid in the defence of the tower. The tower itself was constructed from a darker stone than the rest of the castle, with two rooms -the upper apartment featured a large window complete with window-seats and a large impressive fireplace. A new Great Hall was constructed within the confines of the 12th century Bailey - a structure that remained in use until the early 1600s as an Assize Hall. The strategic importance of the castle and the town of Launceston that developed around it (the only example of a walled town in Cornwall) declined when in the late 13th century, the administrative centre for Cornwall was moved from Launceston to the Duchy Palace at Lostwithiel. The castle fell into disrepair, despite still holding the local Assizes and the jail. The castles role as a prison continued with George Fox, the founder of the Quakers being confined there for eight months in 1656. During the Civil War, the castles walls and defences were in such a poor state of repair that the Parliamentarian army did not bother to damage them when they gained control of the castle from the supporters of Charles I.